STARTING IN FALL 2017, Three Hills will publish smart, informative, entertaining, and provocative books about New York State and the Northeast. From history to unusual hobbies, from politics to pop culture, from the environment to the economy, from sports to tourist spots, Three Hills will cover the Empire State, its people, heritage, Cornell University, and much more. 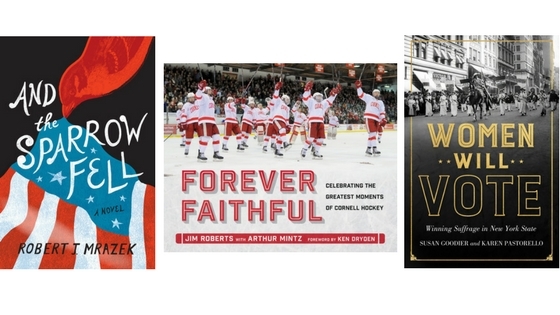 This new, regional imprint solidifies Cornell University Press as a leader among university presses, bringing our attention to detail and impeccable standards to topics of interest to the savvy, independent book buyer. New York State has a wealth of stories that demand to be told and that need to be given the widest possible audience. Three Hills books will all be available at a trade discount through all major channels, online and brick-and-mortar. “With Three Hills we extend our presence in New York State, and make a commitment to publish books that matter to New Yorkers, whether they live upstate or downstate,” said Michael McGandy, editorial director of the new imprint. As we approach our 150th anniversary, America’s first university press continues to innovate and to seize opportunities in the market. Our reputation has been staked on publishing scholarship of the highest order, but we also believe that our mission includes offering books that appeal to everyone. Cornell University, New York State, New York City, and the Northeast are replete with subjects that fascinate each and every one of us, and we are determined to publish them in industry-leading ways, disseminate them using pioneering methods, and showcase them from Staten Island to Lake Erie and beyond. For more information on Three Hills contact Martyn Beeny, marketing director: @martynbeeny, 607-882-2197, mb2545@cornell.edu.